I am always searching for Gingerbread inspired clothing and it is nearly impossible to find any even during the Holidays. You either have to have something “custom made” or know a “handy dandy” crafter or someone with sewing skills to have something made. I tell all my friends and family to be on the look out for Gingerbread items during the year as that is always the most perfect gift for me!! 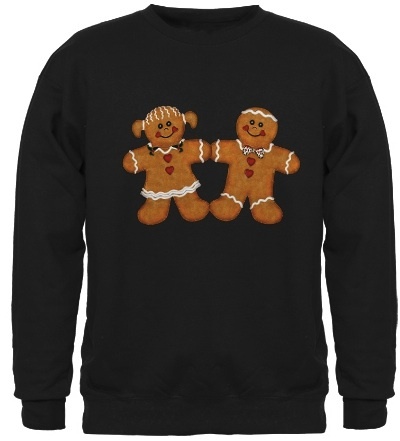 Visit here for details on this fabulous Gingerbread sweartshirt. Sweatshirt comes in black or dark blue and there are also zipup hoodies in many colors. Love them!